One thing I learned about print circulation marketing during my years in publishing is that direct mailing pieces that convert well are often far from the most creative — there’s actually real science behind circulation marketing, with lot’s of trial and error (e.g. testing different offers, different colors). 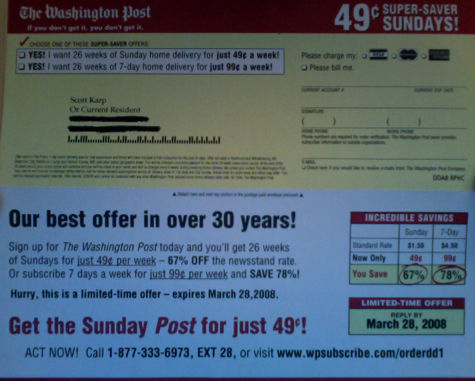 But even by those standards, this offer is striking — it assumes that the only barrier to subscribing to the print edition of the Washington Post is price sensitivity. It assumes that the Washington Post is the only big news outlet that I could choose to have delivered to my door, and so if they just offer a good deal — boom, I’ll subscribe. Newspaper print circulation used to be that way — but no more. I’m not going to get into the well worn debate about the merits of news in print vs. news online — but it’s undeniable that this offer assumes I’m sold on the merits of news in print. Or, again, that there aren’t any other choices. Even worse, the focus the on discounts — up to 78% for 7 day delivery — makes me think this isn’t just a sale — it’s a fire sale. Same offer for over 30 years! But the purpose of this post is not another dump on newspapers rant — it’s to suggest a radical idea. What if the Post actually tried to sell me on the merits of subscribing to the print edition in a way that would actually appeal to me, instead of sending me a glorified coupon for a product I’m not in the market for? There has been so much written by defenders of news in print — but has any of them actually picked up the phone to call the circ marketing department? How many newspaper editors have recently seen what their circ marketing department is mailing? I’ll bet not many. That, needless to say, is the product of decades of monopoly distribution, where couponing was all that was required to grow circulation, and editors never had to concern themselves with ensuring the product they created was one people actually wanted to buy. OK, so enough evangelism, enough ranting about why this offer didn’t work. There was a great piece in the New York Times about the movement to unplug once a week from a harried, always-on digital life — that certainly resonated with me. Our best offer in over 30 years! Now that’s appealing — I would have actually paused to consider it. Of course, no amount of marketing enhancement will fix a broken product — The Washington Post and most other newspapers are still largely put together as if no one is getting their news online — and nothing could be further from the truth. But what if the Post told me that reading the print edition was not only a way to unplug, but also a thoughtful complement to the breaking news I’ve been consuming online round the clock? And what if they actually published a Sunday edition that wasn’t jam packed with information I could more efficiently get online, so that I didn’t have to feel guilty about dumping most of it right into the recycling bin? What if instead they stripped down the Sunday edition and designed it for the type of unplugged relaxation and reflection that I’m seeking? What if they actually produced TWO editions of the Sunday paper — one for the shrinking demographic who still consumes news the same way they have for decades, and another for a demographic whose news consumption has been fundamentally changed by the web? To save this post from being just an another empty piece of evangelism, here’s a challenge for The Washington Post… I know you’re listening. Send me a subscription offer for the Sunday edition that actually appeals to me (forget changing the product, we can get to that later), and I’ll subscribe — cash on the barrel head — 49 cents a week. And not only will I subscribe, but I’ll actually commit to reading the Sunday edition every week for at least three months (half the subscription period) — and I’ll provide constructive feedback every week, right here, where any newspaper that hasn’t given up on print might learn a little about readers who have given up on print… any maybe get some ideas for how to reinvent their products in a way that might reverse that trend. So come one, enough talk, let’s see some action! Our best innovation in circ marketing in over 30 years! I don’t need to give you my address — it’s already in your circ database. As for the everyone else — is there a marketing pitch that would get you to subscribe to your local paper if you don’t currently? Is there a different print product than the one your local paper currently publishes, that you would consider subscribing to? Share below.